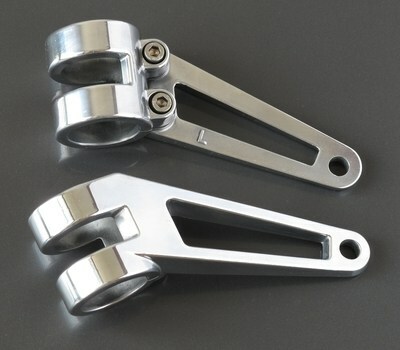 Classic cafe racer style angled die cast alloy headlight stays. Available in 35mm, 36mm, 37mm, & 39mm diameters. Unlike others on the market which are sand cast, ours are die cast. This produces a much finer quality highly defined casting with less porosity and without the pock marks common to sand castings. Length 114mm. The headlight height can be adjusted (by approximately 50mm up) compared with original SR fittings or turn them over and they will be in close to the straight position. The headlight installation hole diameter is 10mm.